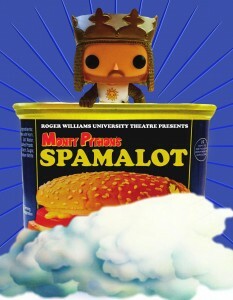 If you’re a fan of Monty Python and the Holy Grail but haven’t seen the musical Spamalot, Roger William’s University’s production is a great opportunity. For a mere $10 admission, you can see why this funny satire that mocks theatrical musicals and epic films ran for five years on Broadway. Theater announcements before a show generally ask us to turn off our cell phones and quietly unwrap our candy, tell us how to exit during an emergency, and so on, but this show opens with a video, like many of the artsy Terry Gilliam animations in the film, asking the audience to do the opposite of all of these things. This bit set the tone for the night. Unfortunately, only the first three rows of the audience could see the video screen high above the stage due to the low ceilings, so as this device is used repeatedly throughout the show over half the audience is left with at most half of the joke. The choreography by senior Cayley Dorr is complicated for the small stage and cast of 18. Some standout numbers include “Always Look on the Bright Side of Life” – complete with twirling umbrellas – and “You Won’t Succeed on Broadway.” The male chorus was more confident in their dancing and singing than the female chorus. All the big group numbers worked well for such a tiny space, except that the stage-left exit tended to bottleneck, on occasion, as actors simultaneously entered and exited. The seven-piece band was strong, however their location on stage right was distracting Technical aspects, notably the sound design by Matt Paquin and the elaborate costumes by Priscilla Eighme, enhanced the play. As Director Jeffrey Martin suggests, producing Spamalot, with the confines of space and budgets, while staying true to the expectations of fans of Monty Python and the Holy Grail is a double-edged sword. For those fans, and even those who have never seen The Holy Grail, this production is worth the trip for two hours of silliness meant to distract us from the rainy, cold spring.